The set-top box has evolved into an all-in-one type device. 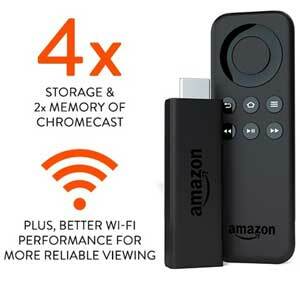 It all began when Google released Chromecast, a set-top box no bigger than a thumb drive, which fits behind your TV. 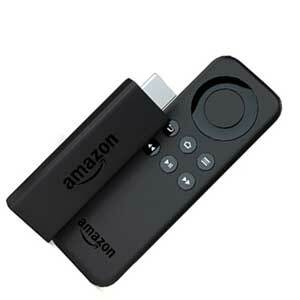 Now Amazon is swiftly moving to the new, widely-accepted standard, with the Amazon Fire TV Stick. It looks like the Chromecast, but offers a little more in the way of features. But does it do enough to merit a purchase? The Amazon Fire TV Stick costs jut $34 and is available in the UK and US. The stick fits flush with most HMDI ports and, unlike the Chromecast, has a decent remote, of which more later. The amount of content offered is immense and includes Showtime Anytime, Pandora, HULU, HBO Go, Netflix,Amazon Prime Instant Video and a number of others. Amazon is smart to price it at just $35; it’s a bit more expensive than the Chromecast, but a lot less than the Roku Streaming Stick, and it certainly offers much better value. However, the Fire TV Stick feels devoid of personality without Prime, which is also its mother service. Perhaps the most attractive feature is a 30-day free trial. A streaming stick is not a game changer any more; it’s just like any other thumb-sized device with flash memory. Amazon does not pull off any design feats and so it looks pretty standard, but perhaps the lack of design features is what allows it to blend into the back of your TV. What I like is the fact that the stick comes with a free HMDI extender cable which, if you have a wall mounted unit, is very helpful. This is something that the $50 Roku Streaming Stick does not offer. Once the stick is seated properly into the HMDI port, you’ve got two power options;either using a micro-USB-powered stick that alsoplugs into your TV, or using a wall adapter which you plug directly into the stick. If you choose the USB-powered option, which is the easiest, the stick will warn that it is not getting enough power, and so you’ll not benefit from the experience. Because the stick has a built-in dual Wi-Fi antenna it can handle 802.11a/b/g/n and a couple of hiccups with your connection with ease, but only if it’s getting external power. In my testing, the stick just didn’t perform as well and I had to reboot it several times. However, the problem was solved when I used an external USB power adapter. The Fire TV Stick comes with a dual-core processor, 8GB of storage and 1GB of memory, which is a lot more powerful than Chromecast’s single processor, 512MB of ram and just 2GB of memory. So, the stick wins this round! The biggest plus of the Amazon Fire TV Stick is that, unlike Apple TV and Nexus Player, there is an abundance of apps. All the in-demand apps like Hulu, Netflix, Showtime, Amazon Instant, Pandora, NFL Network, Crackle and Spotify are available. The Roku 3 boasts over 1000 channelsand the Fire Stick has only a few hundred, but they are better-quality channels that you’ll actually want to watch. There are also a couple of interesting apps like the travel app TripSmart, which has tons of videos and descriptions of exotic locations. Of course, there is also a lot of junk content mixed in with all the good stuff, so it takes quite a bit of time to figure out which is which. 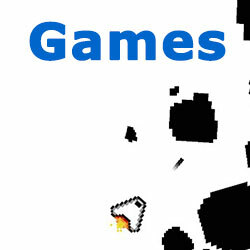 Games are few and far between. Most games are graphically inferior, so do not expect to play the more demanding games like The Walking Dead Season 1 or 2. GTA is also out of the question, even though the system does claim the right specs to play the games mentioned. Perhaps there is just a lack of content support. Perhaps one of the greatest advantages of the Fire TV Stick is the excellent remote. It weighs almost nothing and feels kind of cheap, but the buttons and features are very powerful. It is also very intuitive which means that you’ll feel right at home from the time it’s unboxed. Keep in mind that although the functionality for a microphone is in the app, it’s not available in the remote supplied. You can buy a different remote from Amazon for $40, but it’s probably not worth it. What most people will find interesting is that you do not need line of sight to flip through the channels. It uses Bluetooth, which does away with the frustration of operating a device that’s stuck behind your TV. The interface is just a slimmed-down version of the full-size Amazon Fire TV’s menu. Though not as clean and aesthetic as Google’s version it’s still not all that difficult to understand, even if you’re new to Amazon’s ecosystem. The video library is extensive and renting a show is very simple. Zipping from one section to the next is easy and,owing to powerful hardware, there is no lag in your experience. Plus, the predictive technology loads the first couple of seconds so that you can preview the movie prior to renting, a very useful feature. If you have already invested in Amazon’s current ecosystem then this will be the glue that holds it together. The tech is fast and very responsive, but if you’re not a part of the Amazoniverse, I’d recommend checking out the other options beforemaking your final choice.